Yearning for a quieter life, Rachel and Susie came to Laos on a reconnaissance mission, taking in a cooking class in Luang Prabang with an eye to opening a hotel. Wandering through the morning markets with their instructing chef, Susie asked, casually, where they could buy buffalo curd. She was met with stares of horror. 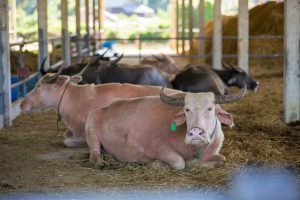 It turned out that, incredibly for them, residents of Luang Prabang had no idea, in a land full of buffalo, that the beasts could be milked. A more concrete idea began to take shape, even as the foursome moved their lives – including five children between them – to Luang Prabang in 2014, where they rented and ran a guesthouse. 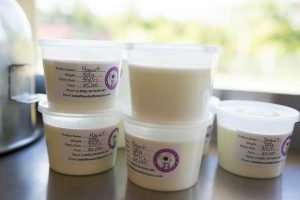 After “some sleepless nights and much research”, the team decided that they could set up the country’s first buffalo dairy themselves, and that the local community could benefit in the process. Their combined training was about as contemporary as you can get – lots of Googling and plenty of YouTube tutorials – before they negotiated to rent three buffalo from a local farmer. There followed six weeks of enthusiastic and much-talked-about daily milking – with a milling audience each day – before they finally had enough milk to bring back into town and start making some cheese. 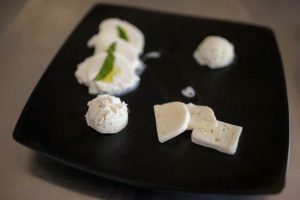 And not just mozzarella and ricotta, but also yoghurt, ice-cream and cheesecake, that they shared with local food suppliers, grocery stores, restaurants and friends. Upon tasting the product, all anyone wanted to know is when the dairy would begin in earnest. 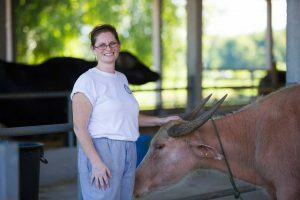 Today, the Laos Buffalo Dairy is well and truly up and running, with 10 buffalo producing 60-80 litres of milk each week (and several more animals about to produce offspring). 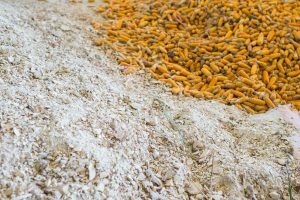 And while the animals don’t yield nearly as much milk as cows (less than 3 litres a day, while cows produce between 30-50 a day), the product is remarkably high in fat and proteins. The farm rents each buffalo for around six months, longer if the milk is good, and quarantine and vaccinate pregnant animals against various diseases. 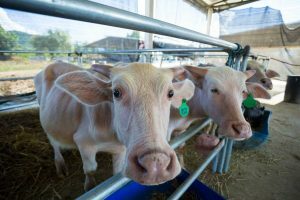 “We’re also working with the Lao government to implement a cross-breeding program to improve the genetic stock of local buffalo, which will mean healthier animals with higher meat and milk yield,” she says. 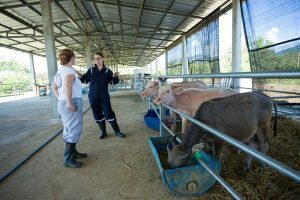 But, walking us through the milking shed, where we are required to wear protective clothing and rubber boots, Rachel tells us it wasn’t an easy journey. “We realised what a massive undertaking it would be right from the beginning,” she says. Even then, the team had to apply for nine different government licenses, interview staff and hire 25 “adventurous souls” prepared to help this team of crazy falangs realise their dream. But they also knew from the outset the scale of the project’s potential. “When we started telling other hotel managers and people we knew around town what we wanted to do, their completely positive responses led us to believe that it would be successful,” she says. Today, the four are usually too busy to reflect on the success of their very unusual mid-life change of scene. With suits and city clothes long packed away, they are just trying to grow the business and keep up with growing local demand for the product. 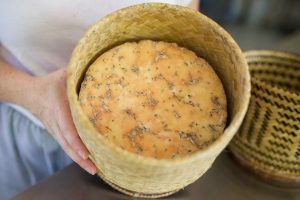 Rachel – the chef of the four – is taking advantage of the low season to try out new recipes, although buffalo is a niche market, and chefs tend to be protective about their buffalo cheese recipes. “I think I have figured out the combinations for the most part. 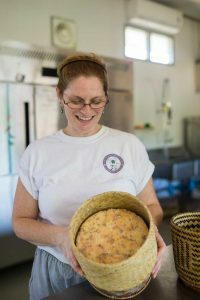 Right now I am experimenting with blue cheese and I can’t wait to try it,” she says. 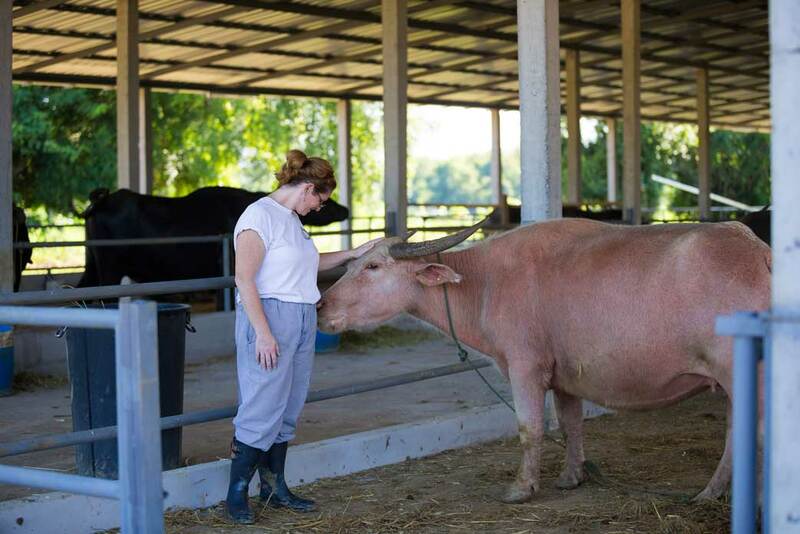 The farm will soon be offering high-end guided tours, that will include feeding baby buffalo and watching the milking, as well as making mozzarella. It will also be open for self-guided tours, with milking demonstrations, a petting zoo, café, gardens and children’s play area. Visit laosbuffalodairy.com for more details.